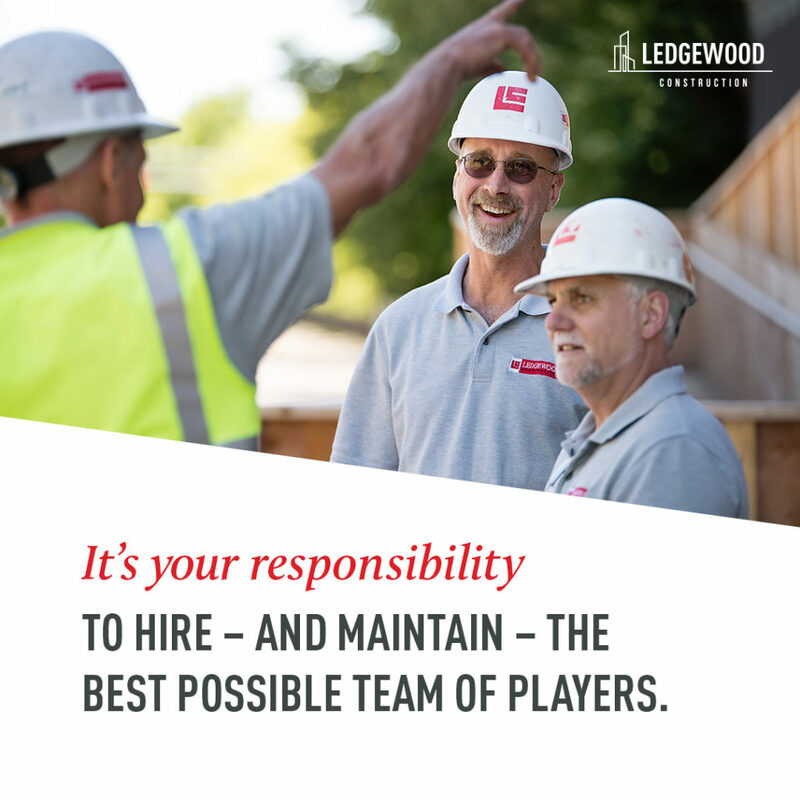 The selection of your construction team can be the most critical decision you make as a building or project owner. You’re preparing to drop extensive amounts of time, money, and resources – not to mention stress – into a project that you need to succeed. The professionals you bring on board to be by your side can dictate the direction the project goes. Great partners can turn a project into a proud accomplishment that you will show off for years to come, and you will remember as a smooth-sailing point in your career. Poor partners can turn a project into a complete nightmare that keeps you awake at night and leads you to buy Tums in the big bottles. The key is, as project or building owner, you need to put together a first-rate team. Poor projects. Before you even start making phone calls, putting requests for proposals out there, or interviewing anyone, you need to understand yourself. The project is being built with the needs of your organization, as well as the vision of you and your organization, in mind. You need to look internally, and get some things straight. Firm up any specific ideas you have about the project yourself, and work through ways you’ll want to verbalize to the prospective team members. Reflect on previous projects you have been involved in. Consider your successes and disappointments, and consider what they might have in common. Where there things you would change from how you’ve done them before, or would want to avoid? Take a look at similar building types and projects. Make lists of things you do like and don’t like about them. Contact other owners and colleagues, or other project managers who have been in charge of similar projects, and ask about recommendations. Know what sort of budget and schedule you have to work with. Know what the functional needs are, and have an idea of a location. Think about how many firms you would like to solicit for proposals, as well as what the criteria is that you’ll use to rank or grade the firms? We can’t stress it enough – building a team before you are fully prepared will do nothing but frustrate yourself, as well as the prospective team members. Because of the variety of team members that you may be bringing on for your project, you need to structure out who will do what. For most projects, you’ll have a team that consists of you, the building owner or owner’s representative; construction manager; an architect or designer; and engineer; and an interior designer. You may require other professionals, but most often, they may be a sub-consultant to the primary design firm. You may need landscape architects, geotechncial engineers, and testing agencies, etc. – that may be considered subcontractors, or they may be separate from the others. Make sure these team functions are planned out, so everyone knows what is expected of them. One of the key steps to building the best construction team for your upcoming project is starting at the beginning. That sounds redundant, right? 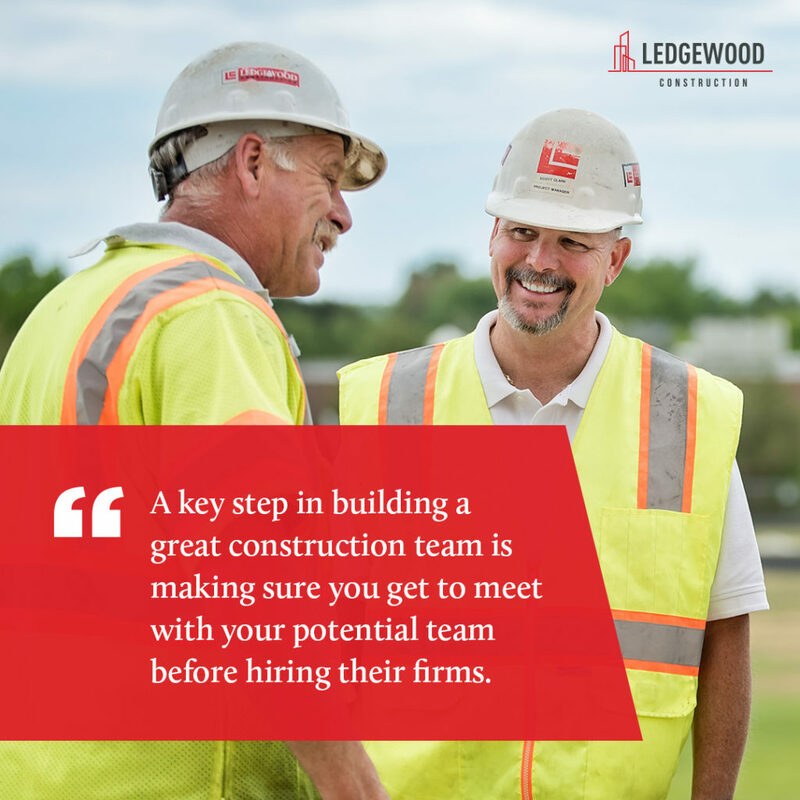 Unfortunately, all too often construction teams are brought in as an afterthought. A construction project could be in the works for years. You, as the owner, kick off the project and work through iteration after iteration with architects and engineers. Your interior designer and construction manager may be sitting on the sidelines, or not even chosen yet. The problem with that is, when it comes time to bring the contractor or interior designer into the team, the core group is already used to working together, and has already made some decision irrespective of the potential input from the new team members. By having everyone together at the start, you don’t just make it easier on them, you give your team members the opportunity to work together longer and create chemistry. Speaking of chemistry, it’s a vital issue. You may have great chemistry with a firm that sends in staff members for the interview process – but are you guaranteed to be dealing with those members throughout the project? Don’t settle for meeting the sales team, or the high-level staff, and then meeting who you’ll be working with at a later date. Ask potential team members to send the staff you’ll be dealing with day-to-day for their interviews. Just as you having chemistry with the team is important, the team needs to have chemistry and solid working relationships with each other. They need to be able to trust each other, collaborate with each other, and resolve conflicts quickly. Consider asking potential team members for references for other areas of the project. An architect might have an interior designer in mind that they work well with, and that they already have a solid relationship with. This could smooth the path as the project moves ahead. Look for team members who do not fear open communication, and are available for discussion as needed. Set out communication guidelines and expectations from the start, and make sure that prospective team members recognize these expectations and have systems in place to ensure they stick to them. You’ve gotten to the point where you have your picks for each slot in the construction team. They know what they are getting in to, what the expectations are. The final step? Make sure you lay the groundwork for team unity. Prepare yourself to be the leader- successful projects stem from solid, reliable leadership that helps to give every team member clarity. Building the best construction team for your upcoming project is so much more than putting together a few firms. As the building or project owner, you can take these steps to create a team that is set up for success, which means your project has a better chance to meet budget, schedule, and function requirements. 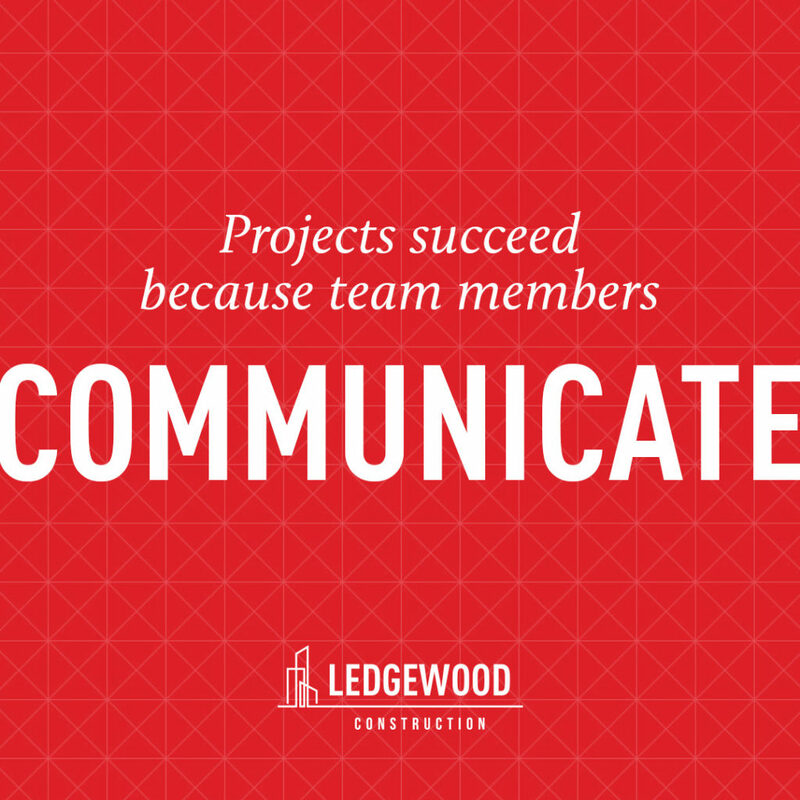 Our family here at Ledgewood Construction is ready to be part of your team, and to ensure your project success.